I rely on main dish salads during the spring and summer months. There's something so wonderful about making a salad in the early morning and letting it chill and marinate throughout the day. Then at dinner time all you do is pull the salad out of the fridge, add some breadsticks, and you're eating. It's almost as good as a crockpot. And these salads keep in the refrigerator for up to 3 days. I have noticed that most of my salad recipes use a mayonnaise based dressing. There's a good reason for this - those are the kinds of salads my husband likes! When I make an oil based dressing, he usually adds some mayonnaise to the salad at the table. When I make a creamy salad dressing myself, I can control the fat content by using yogurt and low fat mayo and he can't tell the difference. Of course, now he knows! I tried to concentrate more on non-mayo salads this time around. These excellent salad recipes focus on grains like barley and rice, beans and legumes, and pasta, with meat as an accent and vegetables or fruit for color, taste and nutrition. You can use any type of purchased salad dressing you enjoy instead of making your own; just think about what dressing would taste good with the ingredients you are using. This fabulous recipe was inspired by club sandwiches, which I adore. 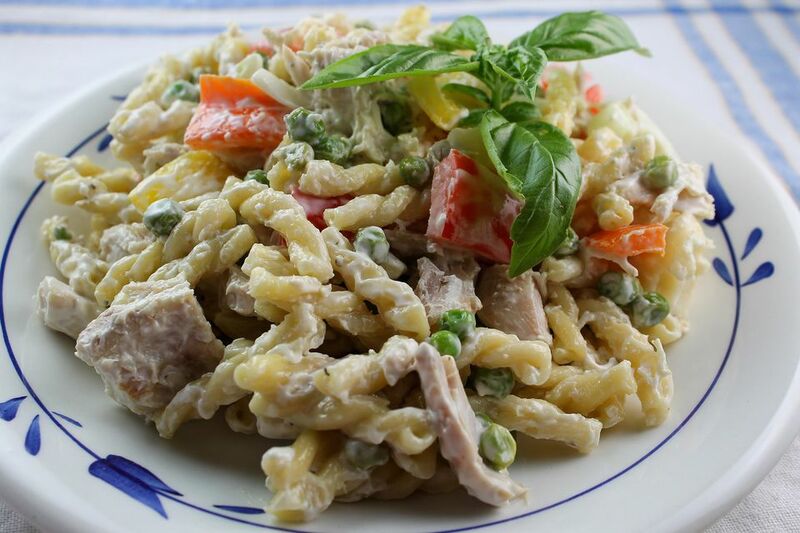 The tender chicken and pasta are combined with bacon, Swiss cheese, and grape tomatoes in a buttermilk dressing. Tender and chewy wild rice combines with juicy moist chicken in an orange dressing for a wonderful taste. Tarragon vinaigrette flavors this fresh and crunchy salad. Oh, this recipe is so fabulous. It was created at the last minute with ingredients I had on hand in my pantry and freezer. Yum. Tender and chewy focaccia is combined with crisp lettuce leaves and lots of veggies in this delicious no cook salad. The combination of tender barley, nutty wild rice, savory chicken, and chewy black beans in a honey mustard dressing is really fabulous. Wheat berries are a wonderful addition to any main dish salads. They have a perfect chewy texture and nutty taste. You can add any cooked, chopped meat to this salad for a more substantial meal. Cobb Salad is usually arranged on a plate. This easy recipe adds pasta with all the succulent flavors of the original and mixes it together for a wonderful meal. Okay, this salad is more indulgent than most, but I just can't resist the combination of tender chicken, lots of herbs, and a creamy salad dressing. Combining vinaigrette dressing, lots of fresh basil, chicken and tortellini makes a delicious main dish salad. There's something about the combination of chicken, curry and orange that is so satisfying. The contrast of flavors, colors and textures in this salad is perfect. The flavors of minestrone are combined in a salad for a new, healthy twist. Couscous and chickpeas have the most fabulous texture when combined in a salad with a lemon dressing and tender chicken.